When it comes to corruption every country has a gourmet menu to choose from. There is systemic corruption, sporadic corruption, political corruption, grand corruption, petty corruption and legal and moral corruption. South Africans are exposed to a daily carousel of apparent corruption featuring a dollop of each of these. But we're not sitting back. While the planned anti-corruption march at the end of this month might hopefully make resistance visible, several organisations, the small axes, are chopping away behind the scenes. By MARIANNE THAMM. On 14 August a new organisation aimed at fighting corruption in South Africa trumpeted its arrival on social media platforms. ExposeIt urged citizens to join its online protest and report corruption wherever they encountered it. ExposeIt “a socially driven movement” was launched by the Justice Alliance of South Africa (JASA), a coalition of conservative corporations, individuals and churches “fighting for justice and the highest moral standards in South African society”. Be that as it may, the small ExposeIt team has been working its social media platforms, urging supporters to change their profile pictures to feature the organisation’s logo as well as relentlessly hash-tagging the campaign – #unitegainstcorruption #enoughisenough #exposeitSA. The campaign has been funded by the Templeton World Charity Foundation essentially established “to support discoveries of new spiritual information and promote spiritual research” for three years. The JASA application for the grant was was supported by Western Cape premier Helen Zille. ExposeIt encourages victims of corruption to turn to its easy-to-use website where it offers a sort of multiple-choice selection method of reporting. Your options under “What officials were involved?” are Police Officer, Traffic Officer, Home Affairs Official, Municipal Official, Politician, I Don’t Know and the all-encompassing Other. The organisation’s Joel Sangster, a JASA board member and information technology specialist, explained that teething problems had led to ExposeIt’s sluggish response to several Daily Maverick attempts to contact a spokesperson. He also said that at this stage the organisation had not exactly been deluged with reports. But what does ExposeIt offer that the non-profit Corruption Watch, launched in 2012 and which has received 8 181 complaints since, doesn’t? Sangster explained that ExposeIt would be focusing not only on attempting to obtain convictions in court but also on the collection of data, which was its most significant difference. “We have already made strategic partnerships with the Hawks, the NPA (National Prosecuting Authority) and crime intelligence to provide this data, not individual names, to identify hotspots,” Sangster told the Daily Maverick. While the Hawks and the NPA might themselves be tainted with the stench of corruption since those apparently sympathetic to President Jacob Zuma have been slotted into top positions, we must allow a small glimmer of hope that their ranks are not riddled beyond redemption. South Africans are increasingly burdened with what appears to be an endemic culture of corruption across all spheres of life, which has cost the country – according to the Institute for Accountability – R700-billion in the past 20 years. But there are a number of organisations dedicated to fighting corruption. There is Corruption Watch, The Institute for Accountability in Southern Africa and Right2Know, all of which have been effective on many fronts and all dependent on philanthropic funding for survival. 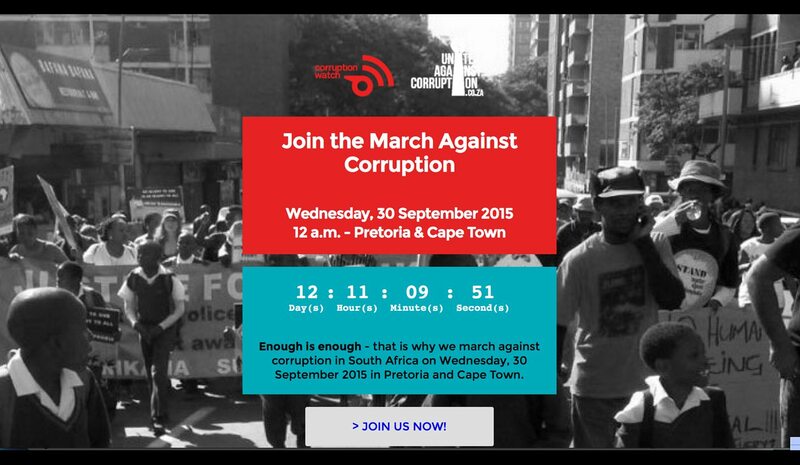 Then there is the recently launched United Against Corruption website, with its count-down clock to the 30 September national march. The journalistic investigation unit Amabhungane, launched in 2o10 and which also relies on philanthropic funding to do its vital work, has been crucial in investigating major exposés of parastatal and ruling party, local and national government corruption. Then there is the National Anti-Corruption Forum (NACF), a multi-sectorial civil society, business and government initiative established in 2001 “to combat and prevent corruption, build integrity and raise awareness”. The NACF’s website appears to have last been updated in 2012 and the last media statement on its archives was issued in 2011. All of these organisations work within a legislative framework that includes The Prevention and Combating of Corruption Act 2004, The Public Finance Management Act of 1999 and The Promotion of Access to Information Act (PAIA) of 2000. The country also has a public service anti-corruption strategy and bodies such as the Office of the Public Protector, the Office of the Auditor-General, the Special Investigating Unit, and the Public Service Commission of South Africa which administers the South African Revenue Service’s national anti-corruption hotline. And while South Africa has ratified the United Nations Convention against Corruption, the African Union Convention on Preventing and Combating Corruption and the Organisation for Economic Cooperation and Developmetn Anti-Bribery Convention, no foreign bribery cases have been pursued since the country joined in 2007. Fighting corruption, according to Corruption Watch executive director David Lewis, is a long-term affair; in fact, it is probably a permanent task, so best brace ourselves for the long haul. The fight depends of the collective efforts of all the above mentioned organisations but also on the key element of political will. Ndungane said Zuma seemed set “on continuing to flout his constitutional duties” in reporting back to citizens through elected officials in Parliament and that his refusal to answer questions “further heighten the perceptions that all are not equal in our society and are becoming less so”. Corruption Watch has, since 2013, made 22 PAIA requests, three of which resulted in the full release of the requested records. The remaining requests have received “either partial responses or been ignored”. The Gauteng education department in particular had failed to respond substantively to many requests, said Corruption Watch. South Africa ranks 72nd out of 177 in the latest Transparency International Corruption Perceptions Index and scored 44 out of 100 where zero indicated a country that is highly corrupt. In Africa, South Africa is ranked way below Botswana (31), Cape Verde (42), Seychelles (43), Mauritius (47), Lesotho (55), Namibia (55), Rwanda (55) and Ghana (61). Over the years the Institute For Accountability in South Africa (Ifaisa), which focuses on public interest litigation, has secured a number of victories including a landmark judgment in the Constitutional Court which led to the reinstatement of an independent unit to investigate priority crimes after the Scorpions were replaced by the Hawks. Ifaisa also instituted litigation to force a commission of inquiry into the arms deal, a bread-price fixing class action, and a challenge to the efficacy of the Dräger breathalyser. If we are looking for some indication of where corruption is taking place, the Corruption Watch annual report provides some insight. Last year Corruption Watch received 2,714 complaints which tallies up to an average of seven per day, 58% of these falling within the Corruption Watch definition of corruption. In 2014 Gauteng topped the provincial corruption charts with 44% of the total reports to Corruption Watch coming from this region. Last year the most predominant ‘type’ of corruption was abuse of power followed by bribery, with a spike in reports about traffic and licensing corruption. In three years, Corruption Watch had received over 1,000 complaints from schools, the bulk of these in Johannesburg. In June 2014 Corruption Watch assisted a group of teachers who had exposed maladministration to track down the owner of a sim card used to harass one of the teachers and a criminal case was opened. It also investigated allegations of financial maladministration at Avon Junior Primary School, a public school in Westville which later led to the principal, Raj Maharaj, being placed on a precautionary suspension. Maharaj allegedly paid a service provider more than R300,000 without following the correct supply chain management procedures. As a result, the organisation embarked on campaigns to highlight corruption at schools as well as educate parents on the responsibilities of school governing bodies. An area which revealed a serious weaknesses with regard to corruption was in the allocation of Reconstruction and Development Programme (RDP) houses, where a lack of transparency and understanding of processes enabled local councillors to take advantage of the system. Other forms of housing subsidies and low-cost housing arrangements were also prone to abuse, Corruption Watch found. Corruption in the housing sector occurred in the provincial and local tiers of government with widespread embezzlement of funds allocated for dwellings, procurement processes and the allocation of houses. There have been reports of local councillors accepting bribes and also allocating RDP houses to friends and relatives. The organisation found the proceeds of corruption “are also frequently laundered through the purchase, usually for cash, of costly luxury goods, such as expensive properties, cars, jewellery, artworks, yachts, private jets and casinos” and suggested that retailers and agents involved in the trade of luxury goods be subject to the same “know your customer” standards imposed on banks. In 2013, the Constitutional Court handed down a judgment in the South African Social Security Agency (Sassa) matter, to which Corruption Watch was party, setting aside an unlawful R10-billion Sassa grants tender. The court ordered that a new tender process be administered. Corruption Watch has also undertaken to continuing “to exert pressure on Sassa and the National Treasury to ensure that the new bid process is transparent and that all required steps are taken to ensure that proper procurement processes are followed”. Another victory was the unearthing of a multimillion-rand water tank installation project for RDP and rural households in KwaZulu-Natal that was “riddled with complications and heavily compromised by poor governance”. An internal audit leaked to Corruption Watch revealed that irregularities had been picked up on and raised at the start of the project. The organisation has subsequently submitted a request in terms of the PAIA to access to further documents in relation to this project. After an intervention by Corruption Watch, the acting manager of the Roodeplaat Dam Nature Reserve, Debbie Joubert, was suspended by the Gauteng infrastructure and development department for using government land to run a private business. Joubert, erected shacks at the nature reserve, which she rented to employees. She also channelled visitors to the nature reserve to a private resort run by her husband’s company. It is also because of an intervention by Corruption Watch in May 2014 that a preliminary investigation into allegations of fraud and theft involving officials in the South African Municipal Workers Union, as well as a private company rendering services to the union, was conducted. The organisation assisted with the opening of a criminal case to the Commercial Crimes Unit and the South African Police Service has reported that this matter will soon be heard. Allegations of corruption at the National Health Laboratory Services involving irregular expenditure of R18-million by a former University of the Witwatersrand professor over a period of 10 years were also exposed by Corruption Watch working with Health-e News. The matter is being investigated by the Hawks. Lewis said Corruption Watch had identified a number of targets for the next phase of its work, including “exposing the impunity enjoyed by those who are politically well-connected; reforming the criminal justice system; making political party funding transparent; reforming the procurement system; reducing the vulnerability of local government to corruption; and shining a light on the flow of illicit funds to and from South Africa”. The ruling party itself has identified corruption amongst is ranks and members as one of the key threats to the party itself. And a sick African National Congress in turn means a sick South Africa. Whether those who are not corrupt will be able to eject those who are entrenched or who stand to gain because of corruption remains to be seen.